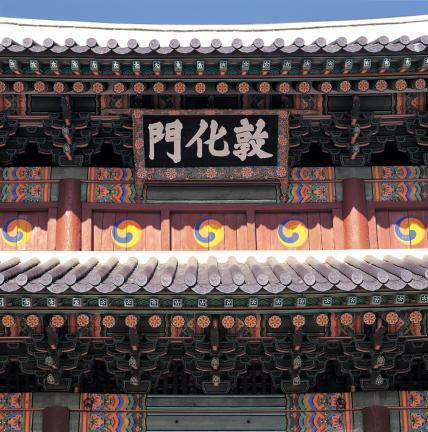 ‘돈화(敦化)’라는 말은 원래 중용에서 인용한 것으로 ‘공자의 덕을 크게는 임금의 덕에 비유할 수 있다’는 표현으로 여기에서는 의미가 확장되어 ‘임금이 큰 덕을 베풀어 백성들을 돈독하게 교화 한다’는 뜻으로 쓰인 것이다. 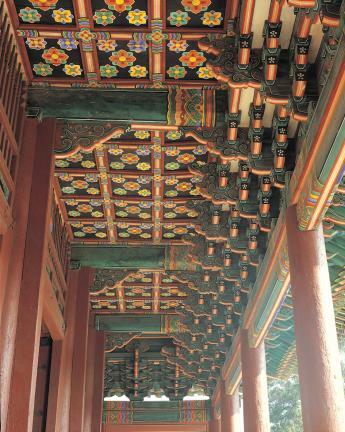 보물 제 383호인 돈화문은 현존하는 궁궐의 대문 중에서 가장 오래된 목조 건물로, 1412년 5월에 세워졌으며, 1609년(광해원년)에 중수(重修)했다고 한다. 돈화문에는 원래 현판이 없다가 성종 때 서거정에게 분부하여 이름을 지어서 걸게 하였다. 정오를 알리기 위해 북을 치는데 이것을 오고(午鼓)라고 하며, 인정은 통행금지를 알리기 위해 28번 종을 치는 것이고, 파루는 통행금지 해제를 알리기 위해 33번의 종을 치는 것을 말한다. 돈화문은 정면 5칸 측면 2칸의 남향 건물이고, 좌우 협칸을 벽체로 막아 3문형식 이다. 중앙은 어문으로 왕의 전용 문이고, 좌우문은 당상관이상 높은 관료가 드나들던 문이지만, 3사(三司:홍문관, 사헌부, 사간원)의 언관은 관직은 낮아도 좌우 문을 드나들게 한 특별한 혜택이 있었다. 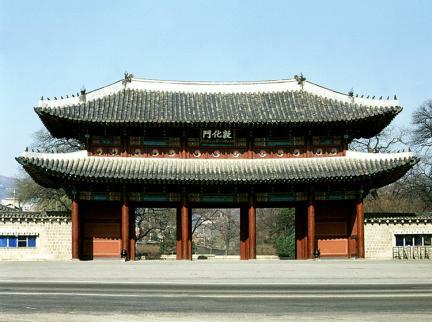 Donhwamun Gate is the front gate of Changdeokgung Palace, one of the five major palaces in Joseon. 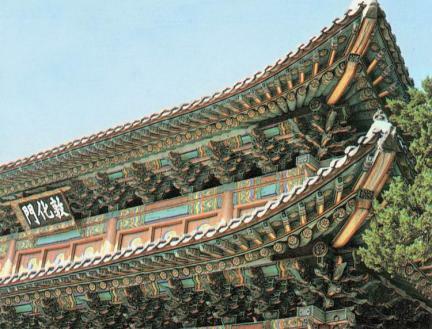 It was constructed in May, 1412, the 12th year of the reign of King Taejong and burned down in Japanese Invasion of 1592. 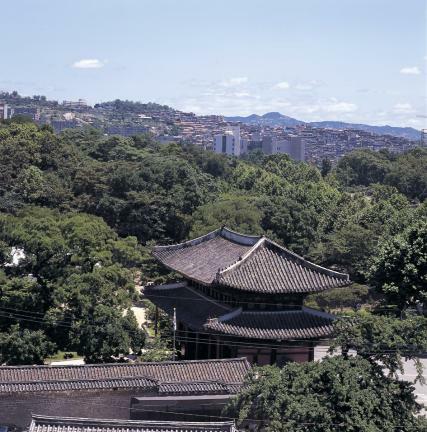 The gate was rebuilt together with Changdeokgung Palace in the 1st year of the reign of King Gwanghaegun (1609). 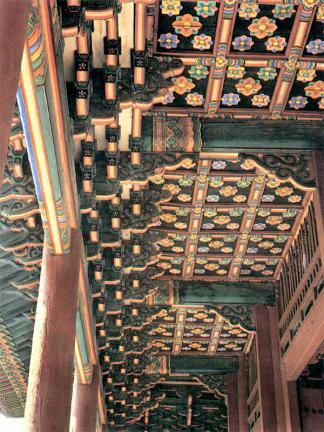 It is a two-story building with five kan (a unit of measurement referring to the distance between two columns) in the front and two kan at the side, and it has a hip roof, called ujingakjibung, showing a trapezoid shape when viewed from the front. 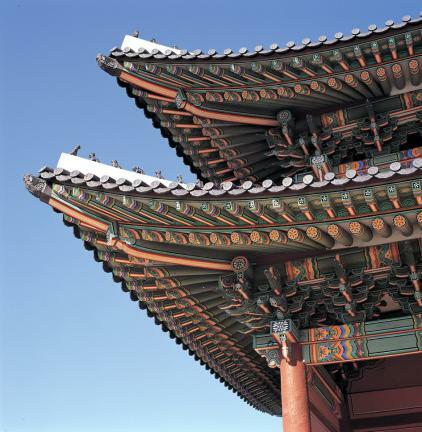 The weight of the roof is supported by column heads on top of and also between the pillars. 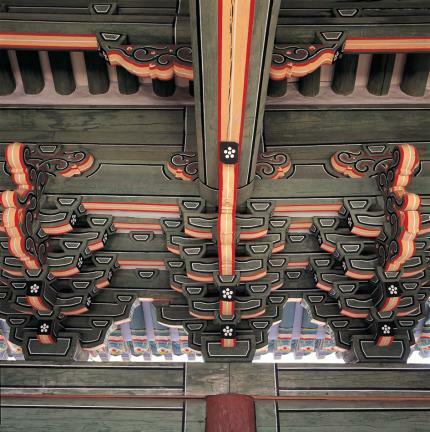 This is called dapo (multiple column-heads) style. 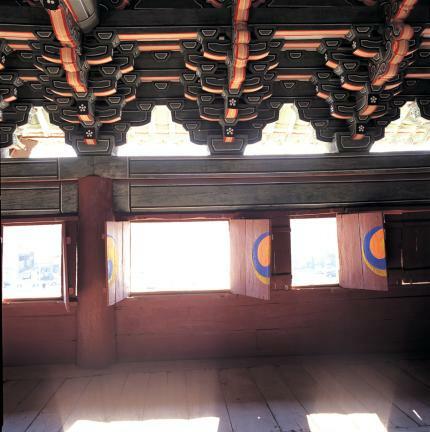 The three kan in the center of the first floor have two doors each but the kan at either end are blocked by the wall. 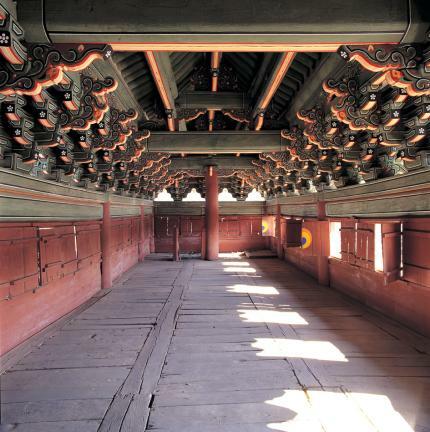 According to a record in the History of the Joseon Dynasty, a bronze bell was hung at the door in the 13th year of the reign of King Taejong (1413), but since the gate has been rebuilt, this can only be imagined. 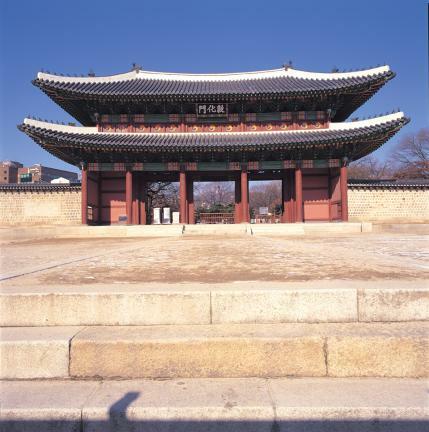 Donhwamun Gate, like Sungnyemun Gate (Namdaemun) and Honghwamun Gate (the front gate of Changgyeonggung Palace), is a cultural asset important for researching the construction style of gates built at the height of the Joseon Dynasty.